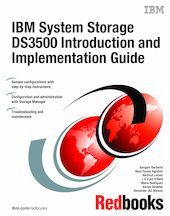 This IBM® Redbooks® publication introduces the IBM System Storage® DS3500, providing an overview of its design and specifications, and describing in detail how to set up, configure, and administer it. This edition covers updates and functions available with the DS3500 Storage Manager Version 10.70 (firmware level 7.70). IBM has combined best-of-breed development with leading 6 Gbps host interface and drive technology in the IBM System Storage DS3500 Express. With its simple, efficient, and flexible approach to storage, the DS3500 is a cost-effective, fully integrated complement to System x® servers, BladeCenter®, and Power Systems™. Offering substantial improvements at a price that will fit most budgets, the DS3500 delivers superior price to performance ratios, functionality, scalability, and ease-of-use for the entry-level storage user. The DS3500 supports intermixing four 1 Gbps iSCSI or four 8 Gbps FC host ports with its native 6 Gbps SAS interfaces. This flexible and multi-purpose dual protocol approach allows organizations to implement a single storage system to support all of their shared storage requirements, there by maximizing productivity, reliability, and cost. Delivering solid input/output per second (IOPS) and throughput, the DS3500 controllers offer balanced and sustainable performance. The DS3500 can effectively double the performance of the previous DS3000 series of storage systems in both throughput and IOPS. The DS3500 DS Storage Manager is the same management software offered with the DS5000 and DS4000® series. Now, any of these storage systems can be viewed and managed from a single interface. This allows for consolidated management of these various storage systems and a reduced learning curve. The DS3500 also supports enhanced remote mirroring over FC host ports, which is also compatible with the DS5000 and DS4000 series. This allows for low-cost backup and recovery with a DS5000 and DS4000 at a production site and a DS3500 at the secondary site. This book is intended for customers, IBM Business Partners, and IBM technical professionals who want to learn more about the capabilities and advanced functions of the IBM System Storage DS3500 with Storage Manager Software. It also targets those who have a DS3500 storage system and need detailed advice on how to configure and manage it.